LOS ANGELES - March 6, 2019 - PRLog -- The United Premier Soccer League (UPSL) is pleased to announce California United FC's Abraham Villon has been named its 2018 Fall Season Most Valuable Player. Villon led California United FC all the way to the UPSL Fall/Winter 2018/19 Championship trophy at L.A. Harbor College in Wilmington, Calif., on Saturday, Feb. 9. 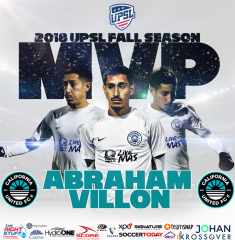 California United FC Vice President of Soccer Operations Ron Gilmore said, "We are honored that Abraham Villon has been selected as UPSL Most Valuable Player for the 2018 Fall Season. At California United FC we are blessed with many terrific and talented players, but Abraham Villon really stepped up his level in the Fall Season, and scored some really big goals in big games and providing a consistent offensive threat that gave our club great balance. It's a pleasure to have Abraham as a part of California United FC, and he now joins some great company with Paolo Cardozo and Kyle O'Brien as UPSL MVPs." Villon, a native of Southern California who played at four different levels (U15-U18) for the United States Youth National Team, had seven goals and 13 assists in a career-best season for California United FC. California United FC (13-0-1 overall) claimed the UPSL's Pro Premier Western Conference during the regular season and was dominant en route to the UPSL Fall/Winter 2018/19 Championship Game. Led by Villon's consistent scoring, California United FC defeated Kern County Mustangs FC and Orange County FC 2 in the SoCal Division playoffs. He then got the game-winning goal to defeat JASA Redwood City, 1-0, in the UPSL Western Conference playoffs before dishing three assists in the CUFC's 9-1 in over Logrones Denver FC in the UPSL West Final. The UPSL Fall Season Most Valuable Player was selected by members of the league and journalists covering the UPSL.